If you’ve never enjoyed a landjaeger, you’re in for a treat! They’re a type of sausage made with premium cuts of beef and pork and then seasoned and smoked to perfection. What makes a landjaeger special is they need no refrigeration and stay fresh and edible for months. 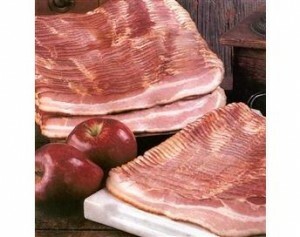 They can be enjoyed sliced as a snack with cheese and crackers, added to recipes, or even cut up as a breakfast sausage. It’s a Monroe area tradition! Landjaegers are hard to locate in stores, even specialty sausage shops. 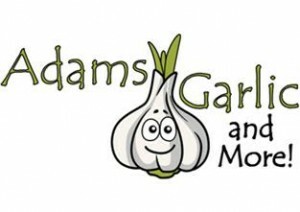 You can order them online and have them shipped to your doorstep direct from Zuber’s in beautiful Monroe. Click on their website, linked above, place your order and enjoy! All 50 states are available, as well as world maps and foreign country maps if you want to expand your horizons. Different display options are viewable at their site, including slotted designs allowing you to simply “slide and display” the caps you wish to showcase. 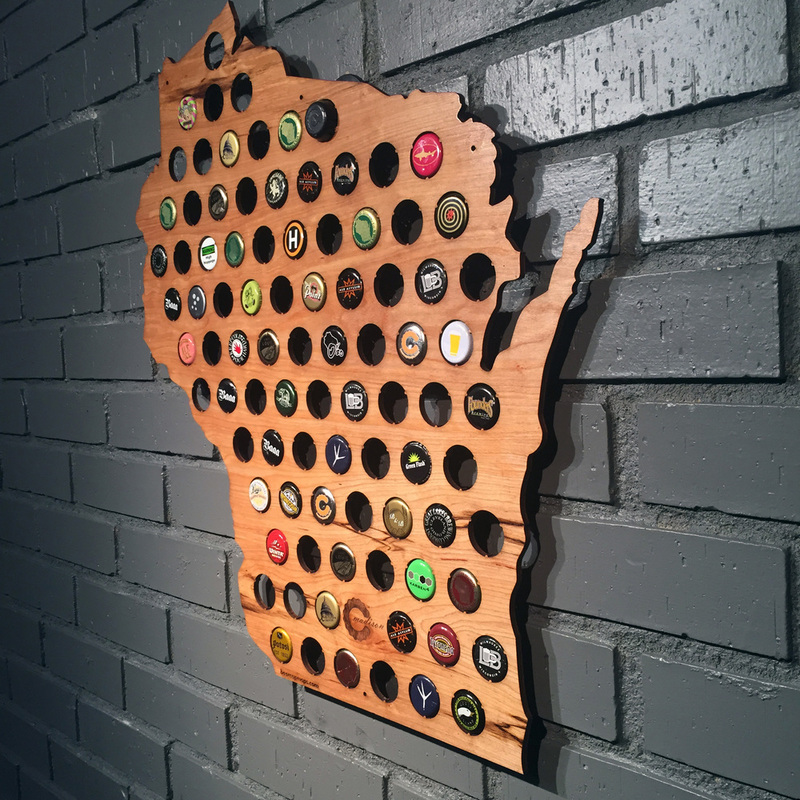 Beer Cap Maps … the perfect gift idea for the beer lover on your list. Cheers! Check out their gift suggestions for special occasions – you’ll find Anniversary Gifts, Graduation Suggestions, Traditional Holiday Gifts, and even Sympathy Gift Ideas. 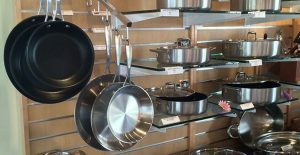 There are hundreds and hundreds of unique specialty items at available at their site – it’s a Wisconsin treasure trove! In the meantime, you can avail yourself of some of Colonel Pabst’s special blend worcestershire sauce. It’s made from Milwaukee Amber Lager and a blend of spices and it works perfectly well in a Bloody Mary, thank you very much …. Three Queens Organic Maple Syrup: We’re big fans of maple syrup and enjoy sampling different varieties from around the country. Did you know that, much like honey, maple syrup offers a slightly different flavor profile depending where it’s sourced? The business is located in the southwestern part of the state and situated on 80 acres of woods with ample Maple trees. At their website, there’s a list of locations you can buy locally and you can also order directly online. We hope you come to enjoy maple syrup as much as we do. Syrup sampling is quite the enjoyable taste test hobby! If you’re driving through southwest Wisconsin, stop in their store – it’s open Monday through Saturday. If not, check them out online – they’ve got quite a selection! Swiss Colony: Located in Green County in southwest Wisconsin, Monroe is one of our favorite one nighter car trips in our area. Known as the “Cheese Capital of the World”, Monroe and Green County are home to several cheese makers and couple of regional breweries. The brewery in Monroe makes our favorite sudsy beverage, the tasty and quaffable Huber Beer, which is reason alone to visit the town! 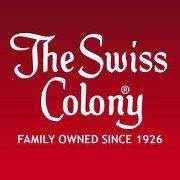 Swiss Colony is particularly known for their cheese gift sets, but they’re also revered for sausages, mustard, baked goods, chocolate … pretty much anything that tastes good! A warm, welcoming community, New Glarus is well known for its independent shops, brewery, and historic taverns. It’s a fun town to walk around, and when you do, be sure to stop in the New Glarus Bakery. It’s right in the heart of town but if you’re not sure where to go, just follow anyone walking with a purpose because chances are that’s where they’re headed! The Bakery is particularly known for their artisan breads (the Cheesy Baked Potato Bread is fantastic!) 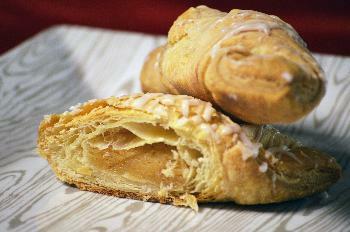 and they also bake special treats like scones, stollen, almond horns, and butter cookies. We love buying a loaf of their bread and some local cheese and having a picnic at the park in town – bliss! If you can’t make it to New Glarus in person, visit the Bakery’s website where you can order many of their specialties to be shipped to your door. Anyone who has been to this town will appreciate a gift from the Bakery! Beloit has done some exemplary work to their historic downtown. It’s kind of like a small Madison, with independent shops popping up and thriving and pedestrians bustling about. One store in particular that impressed us was Bushel & Peck’s, a combination specialty market, cafe, and prep kitchen that has become a treasured community gathering place. Bushel & Peck’s focus is using local organic produce from area farms to serve in their cafe as well as preserve it for use year around. The market side of the store is stocked with local food specialties, cheese, beer, and other goodies. In the midst of the market is the store’s Preservation Kitchen, where jams, pickles, sauces, condiments, and more are made fresh then jarred and packaged for the public. To expand their profile, the store has set up an Etsy shop so folks can purchase online. 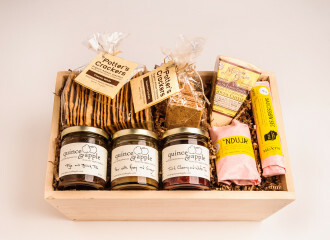 You’ll find the link at their “Buy Online” tab and when you click through, you’ll see breakfast jams, gift baskets, pickles, hot sauces, pickled vegetables, and more on a rotating selection. If you’re in the state line area, stop in and say hello! Have breakfast or lunch at the cafe, and enjoy exploring downtown Beloit as much as we did! Jelly Belly Candy Company: Whenever we travel, we enjoy signing up to take a factory tour. Thousands of U.S. companies big and small open their doors to visitors where you can see how some of your favorites are made. You’ll also learn a little bit about the company and maybe get a free sample or two! Just over the Wisconsin border from Illinois is the home of the Jelly Belly Candy Company. This company is of course famous for making the jelly bean candies you know and love, but we were surprised with all the other confections they turn out! Actually located in Pleasant Prairie near Kenosha, the Jelly Belly folks offer a fun tour and yes, you do get free samples! There are dozens and dozens of flavors of their signature confection, along with other mouth watering treats like Fruit Gems, Candy Corn, Jordan Almonds, and Chocolate Dips (our favorite!). At the Jelly Belly website, linked above, you can order any of their famous or not so famous products, including a wide variety of gift packages. Made in Wisconsin … and who doesn’t like jelly bellys?? 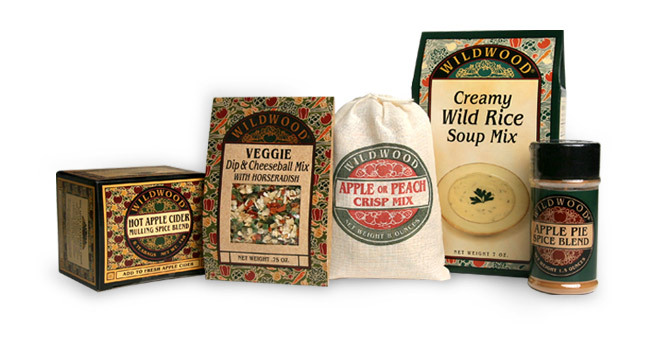 In business since 1982, Wildwood Specialty Foods is best known for their natural dip & soup mixes, signature spices, and breakfast and dessert item mixes. All of their products are created with the highest quality natural ingredients and are additive free. Check out their website, linked above, for easy one stop gift shopping. While you’re there, order some of their many convenient products for yourself and your family too! 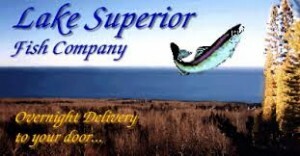 In Superior, one of the best places to buy fresh fish retail (and have it shipped) is the Lake Superior Fish Company. They’ve been around since the 1890’s and are well known in the region for having one of the best selections of fresh, fresh frozen, and smoked fish from the adjacent Big Lake. If you want to bring these special flavors to your doorstep, check out their website where you can have most of their catch delivered overnight. A perfect gift idea too! Walleye, Whitefish, Lake Trout, and Herring are among the selections the company offers, packed and shipped in minimum three pound quantities. Hint: the smoked herring and smoked whitefish are out of this world! Apples and blueberries are just two of the many fruit crops thriving here, and it’s a real treat to visit an orchard and pick your own. If your schedule won’t allow a U-Pick excursion, you can always order some of the fresh fruit preserves this part of the state is famous for. For some of the best farm fresh preserves you’ll ever experience, we recommend the small batch blueberry and strawberry varieties made by Blue Vista Farm. They’ve been around in one form or another since 1910 and their fields are flush with apple trees, blueberries, and strawberries. 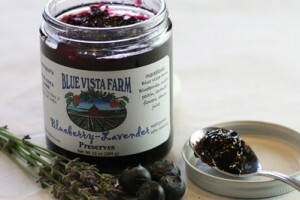 Those which aren’t picked by farm visitors are made into their spectacular preserves, ranging from Blueberry to Strawberry Bliss, augmented by sweet basil. 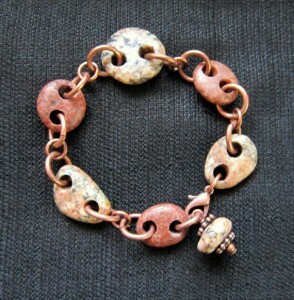 Check out their website and place your order, for yourself or as a gift. Enjoy the fresh flavors of the beautiful Bayfield Peninsula! Though they’re best known for their hard Italian cheeses (like Asiago and others), the company makes a fantastic Applewood Smoked Cheddar. The slight smoky flavor blended with the sweetness of apple makes this a perfect appetizer cheese – great when pairing with wine or by itself on crackers. A Badger State tradition since 1945! A multi faceted artist, Diane creates paintings, jewelry, and is a published author. 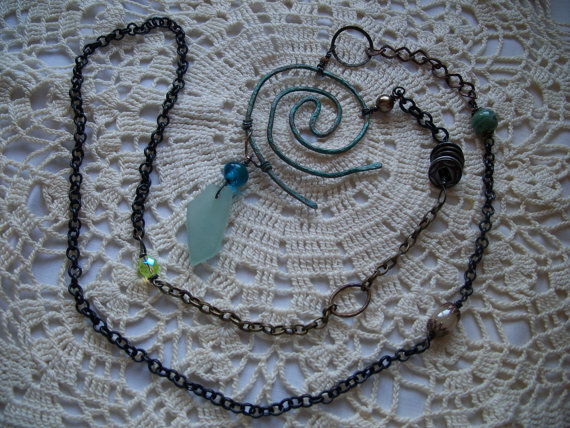 She also creates beautiful and whimsical art, and jewelry she calls “tossed and found” as her works center around items which have been discarded or washed up onto Madeline Island beaches. A truly local gift idea, each piece is one of a kind and inventory changes frequently. 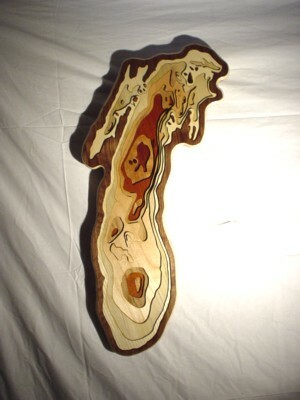 If you’re looking for something special for someone with a warm place in their heart for northern Wisconsin and Lake Superior, you won’t find anything much more unique than these creative pieces! Great River Organic Milling: Located in western Wisconsin along the upper Mississippi River, this company stone grinds organic grains, bread and specialty flours, hot cereals, and pancake & waffle mixes. We particularly enjoy their hearty breakfast cereals, like their Rice Cereal, made with brown rice and barley. It’s similar to Cream of Wheat but made with whole grain. It’s easy to prepare and tastes great with a bit of cinnamon and local honey. Another option is the Multi Grain Cereal, made with brown rice, wheat, corn, rye, oats, millet, and barley – a very healthy way to start your day! 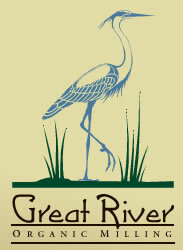 A certified organic company, Great River Milling offers their products via Abe’s Market – there’s a link on their website. You can order any of their items in convenient sizes. A great organic gift idea from The Badger State! 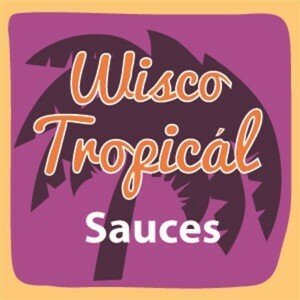 Wisco Tropical: If you thought “Wisconsin Made” only meant great cheese and specialty sausage, you’ve only heard part of the story. 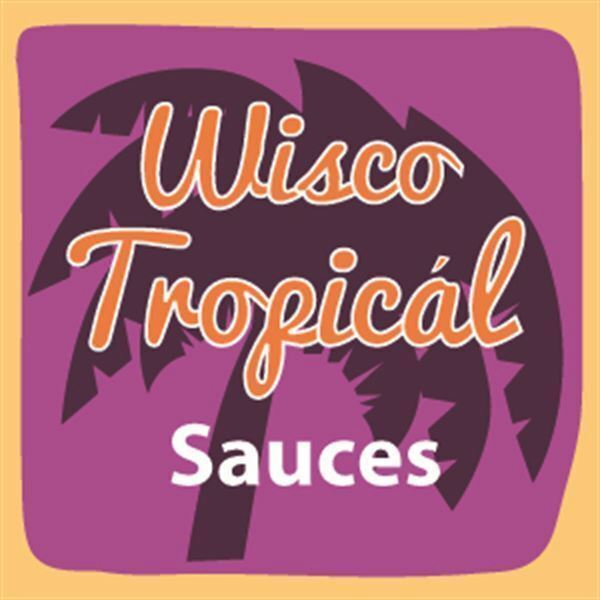 An innovate company located in Madison is using locally grown ingredients like cranberries, pears, onions, garlic, along with Caribbean style hot peppers to create two hot sauces that blend the tundra with the tropical! You can order convenient two packs and four packs of both sauces at their website – they’ll help you warm up some of those cold Wisconsin nights! Based out of the lake shore city of Manitowoc, this small company called MFP Foods produces Uncle Paul’s Home Style Barbecue Sauce. Founded in 2004, they’ve got a line of barbecue sauces practically guaranteed to be unlike any you’ve tasted. We snapped up a few jars in a small store in the Manitowoc area and were delighted with the Wisconsin themed ingredients like local maple syrup and honey along with molasses, brown sugar, and local apricots and cherries. If you’re at all surprised by cherries as a bbq sauce ingredient, don’t be, because cherry wood is commonly used for smoking meats due to the slightly fruity flavor it imparts – especially to pork! 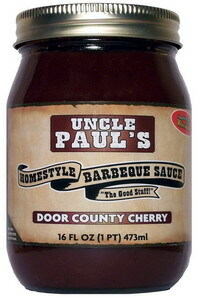 We brush Uncle Paul’s on burgers as they’re grilling and also on ribs and pork roast. It’s a terrific dipping sauce too! 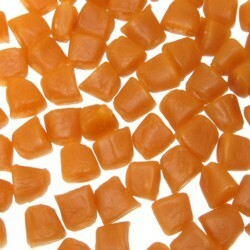 There are actually seven different varieties available, all of which you can order at their website. Flavors include Mild, Medium, Hot, Cranberry, Habanero Hot, Door Country Cherry (pictured), and Strawberry. The Strawberry variety is really good too! You can support this small Badger State business by visiting their website and ordering a few jars of some really unique and excellent barbecue sauce … enjoy! Trainor’s Maple Essence Farms: Located in Menomonie just west of Eau Claire, the Trainor family has been producing maple syrup at their farm for over 60 years. 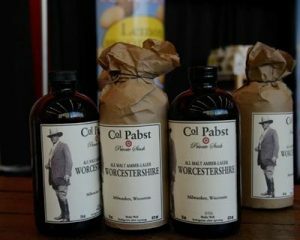 Now if you think great maple syrup only comes from the New England area, try this! Trainor’s Maple Essence Farms attributes their maple syrup’s award winning flavor to the location of their maple trees. They grow near a large deposit of natural limestone, a type of mineral known to filter out impurities. The farm’s syrup won 2nd place in a national tasting contest hosted by the North American Maple Syrup Producers for their dark amber variety. You can buy Trainor’s maple syrup products directly at their website in a variety of sizes. Makes a great gift from The Badger State too! 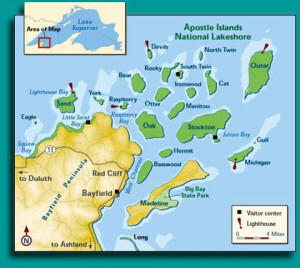 The Apostle Islands National Lakeshore is located in far northwest Wisconsin along the Lake Superior shore. The area consists of 12 miles of mainland and a 21 island archipelago just off the Bayfield Peninsula. These small islands, which were afforded National Park Service protection in 1970, offer a haven for migrating birds and water life and provide numerous recreational opportunities for kayakers and naturalists. You can support the Friends of the Apostle Island National Lakeshore via tax exempt donations at their website, Or, shop at their “Friends Store” which offers island lighthouse prints, logo apparel, and a beautiful coffee table book about the Apostle Islands. We hope your travels bring you here at some point – it is an area of incredible natural beauty everyone should experience! Synonymous with Wisconsin, cheese curds are a treat you’ll see on the menus of many independent restaurants across the state. 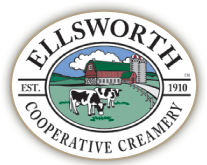 At Ellsworth Cooperative Creamery, they’re vacuum packed and shipped all across the country via their online store. Baumgartner’s Cheese Store and Tavern: We are so pleased to introduce you to one of our favorite places ever (and we’ve been to a lot!) … Baumgartner’s in the southern Wisconsin town of Monroe. 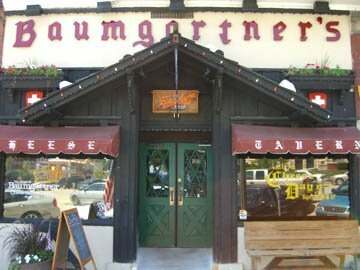 Baumgartner’s is a fixture in Monroe, a really cool town just a few miles north of the Wisconsin / Illinois border. 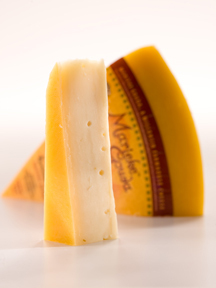 The area where Monroe is located, Green County, is home to many cheese makers as well as the famous Swiss Colony mail order company. We’ve been to Monroe at least a dozen times, mostly to visit the iconic Huber Brewery, now known as the Minhas Craft Brewery. They still make one of our all time favorite beers, Huber Premium, which you can usually find at Baumgartner’s. The brewery and Baumgartner’s are located about two blocks apart, so if you make it to Monroe, visit both … you can thank us later! Since 1931, Baumgartner’s has been the place to go on Monroe’s downtown square. The front is where you buy cheese and meat at their deli counter. In back is the tavern, where you can order cheese and deli sandwiches, their famous chili, and enjoy a few cold ones on draught. Can you tell we love this place?? To get a flavor for Baumgertner’s before you visit, drop by their website. You can buy many of their cheeses in one pound increments as well as some of their meats and even their chili in a jar! Don’t forget to look at their logo merchandise too – that yellow Baumgartner’s hat looks good on anybody! 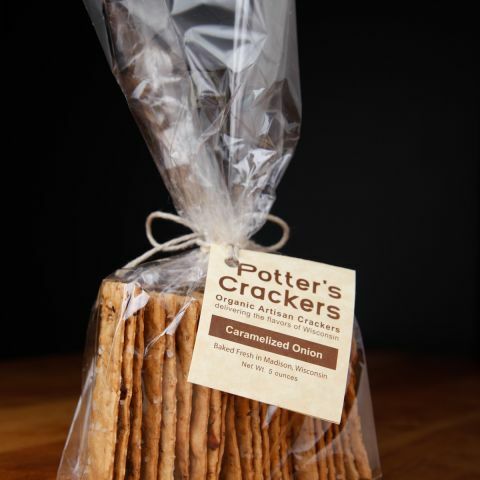 Potter’s Crackers are handmade with whole grain using Wisconsin milled wheat flour and local butter and milk. Gluten free flavors are also available which don’t contain wheat. Seasonal flavors include the likes of Carrot Graham, made with fresh locally grown carrots, as well as Pesto made with basil from local farmers. There’s a list on the Potter’s website showing where you can buy them in your state, or simply order at their website store where you can stock up in minimums of five boxes. A tasty artisan gift from America’s Dairyland! 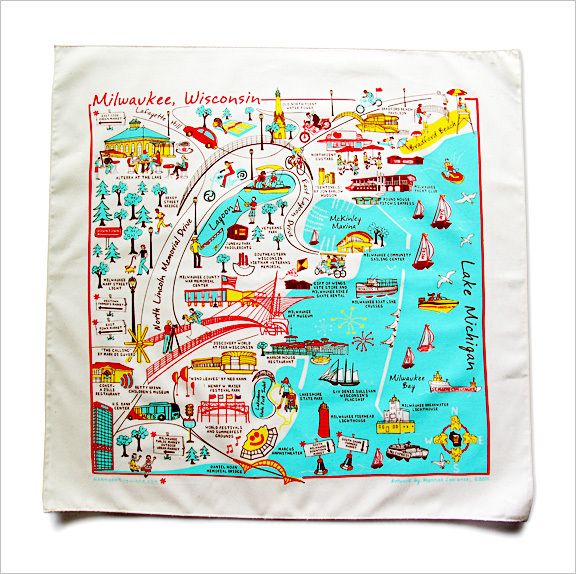 Use it as a headband, a basket or tray liner, display towel, or even as a decorative cloth gift wrap! Maple syrup is tapped from maple trees during the spring, when the daytime temperatures reach above freezing while nighttime temperatures stay below. It’s quite a process – did you know it typically takes about 40 gallons of sap to make one gallon of maple syrup! Besides offering maple syrup in various sizes, Kickapoo Gold also offers maple cream, a spreadable product used like a fruit butter or jam – excellent on baked goods! The syrup is available in jugs, decanters, and decorative gift bottles. You can buy directly from their online store – a wonderful true to Wisconsin taste experience! At their online store, you’ll find all sorts of fruit fresh jams, preserves, jellies, fruit butters, and more. 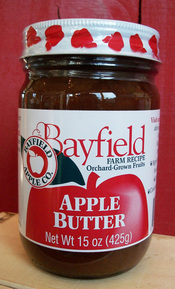 We recommend Bayfield’s Apple Butter – great on bread and other baked goods! They also make apple mustard and a unique red currant mustard. Honey and an assortment of attractive gift boxes are also available. Click through and enjoy the fresh taste of Bayfield! Castle Rock Farms produces many different varieties of cheese, and packages them individually or in gift boxes and packages. 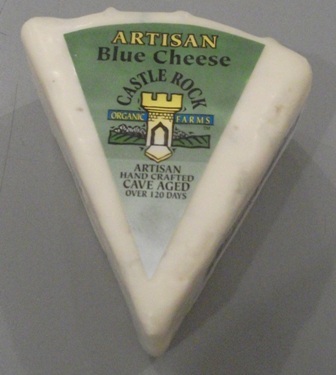 If you’re a fan of bleu cheese, we can highly recommend the Smoked Bleu Cheese Wedge from Castle Rock. We’d tried bleu cheese many times but had never experienced a smoked bleu – the mild smoky taste melds wonderfully well with the distinctive bleu cheese flavor. It’s definitely one to try! 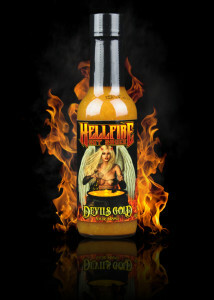 They are Hell Fire Hot Sauce and they make a line of gourmet artisan hot sauces using organic peppers and no extracts. 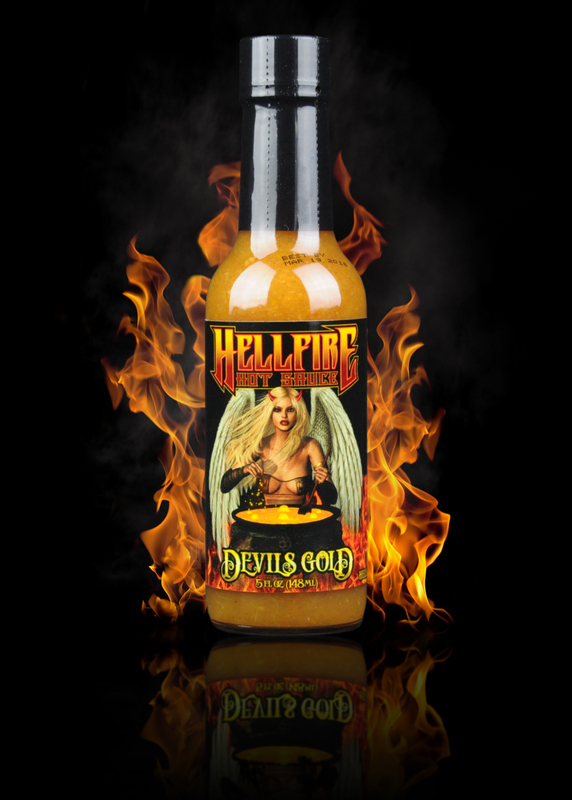 Many of their sauces are made with sweet exotic fruit – a great counterbalance to the heat – just like the one we tried called Devil’s Gold (pictured). We added it to some tacos and it adds a wonderful fruit flavored heat! 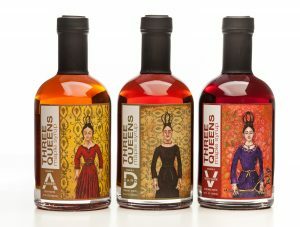 A wide variety of sauces are available and they’re all packaged in eye catching designs – check out their site even if you’re not a hot sauce fan, the labels and graphics are really unique! 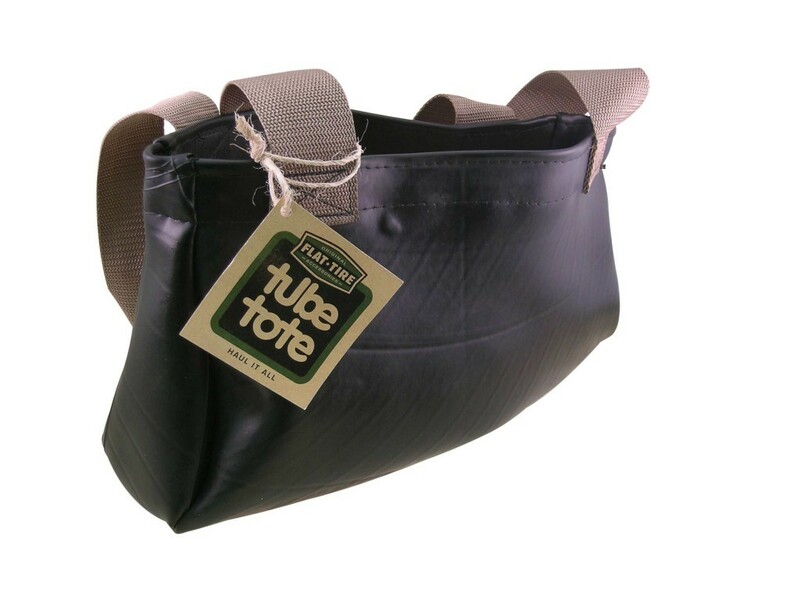 You can order single bottles of whatever variety suits your palate, or get their money saving “Hell Of A Deal” combination packs – great products from iconic Lake Geneva! It’s been around for decades and decades, since 1938 to be exact, and if you’re looking for Wisconsin cheese, this is one of the best places in the state. They carry hundreds of different Wisconsin cheeses, as well as some varieties you don’t see often. Limburger, anyone?? The Wisconsin Cheese Mart is a must see when you visit Milwaukee. It’s a short stroll to some of the city’s famous culinary landmarks and quite near the Water Street entertainment area. 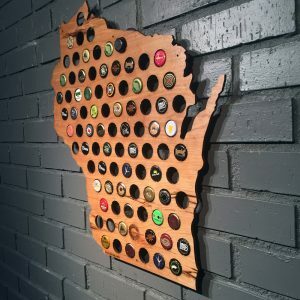 They recently added a Tap Room to enjoy some great Wisconsin beer with the cheese! If you can’t make it to Milwaukee, no worries. 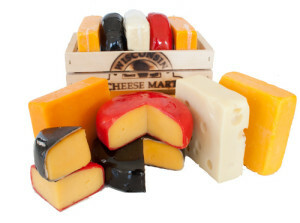 Wisconsin Cheese Mart ships all over the country, and their gift baskets are absolutely bursting with cheesy goodness. 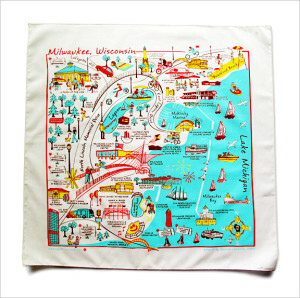 A great gift from Milwaukee! Kim is Kim Lemke, a hard working guy from Wausau who’d been making his special condiment sauce at local joint in town. He noticed the bottles of sauce kept mysteriously disappearing from the tables and thought to himself, “If the customers are stealing this sauce, I can probably sell it!”. Use it as a grilling sauce, marinade, or even as a Bloody Mary condiment! As for the name … it came from an acquaintance of Kim’s who said he was one of the biggest BS’ers he’d ever encountered. Hence, a brand was born! 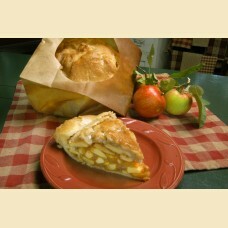 The Elegant Farmer is best known nationally for their signature apple pies which are baked in paper bags. These pies have been featured by Gourmet Magazine, The Food Network, and even the Wall Street Journal. Over a quarter million pies are baked here every year! Convenient gift giving directly from Wisconsin! East Shore Foods also offers several handy gift boxes of their products which contain a variety of their pretzels, mustard, and sauces. A great gift from The Badger State and sure to be appreciated! 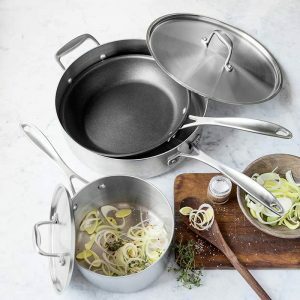 They’re probably best known for their signature product, landjaeger. Landjaeger, which translated means “land hunter” is an old world sausage made from a mix of beef and pork. The meat and spice mixture is packed into a tender natural casing and smoked until ready to serve … no heating or prep work necessary. 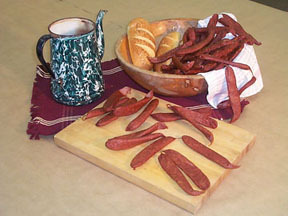 They’re usually served as a ready to eat snacking sausage, similar to how one would eat beef jerky. Landjaeger is twisted into pairs and vacuum sealed. Enjoy them right out of the package! Decorative lake plaques and state maps are also available to buy. A really cool idea! Nueske’s also carries smoked hams, turkey and poultry, sausage, and other specialties. They’ve got some great gift packages, many including Wisconsin cheese, for some handy one stop Badger State shopping. Introduce someone you love (or yourself) to Nueske’s … it will be appreciated! 11). The deepest lake in Wisconsin is Wazee Lake, located just east of Black River Falls. It’s 350 feet deep. You can buy this cheese, along with the family’s other food products direct from the farm via their website. It’s available by the pound, or better still, you can get a whole wheel and delight your family and your guests! These are definitely not run of the mill jams … flavors include pear with honey and ginger, fig with black tea, and strawberry and rosemary, just to name three. As for the cocktail syrups, here’s the thing … if you like to create unique signature drinks, or just something a little different, you’ll love what Quince and Apple offers … Tart Cherry Grenadine (rum punch, anyone? ), rhubarb hops, lime and cucumber (break out the gin), and honey lemon. A mixologist’s fondest dream! Check out their website, get creative, have a little fun! After they were discontinued, they were reformulated in 2013 to (mostly) positive reviews. You can buy a bag or two at the website linked above … just follow the “Buy” link at the top of the page. 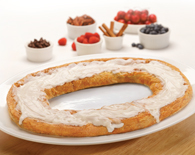 They’re hard to find outside of Wisconsin, but you can order kringle in various sizes and flavors at Racine Danish Kringle … they even have a “Kringle of the Month” Club where you or a gift recipient will receive a fresh kringle delivered to your door monthly … a delicious gift from Wisconsin! 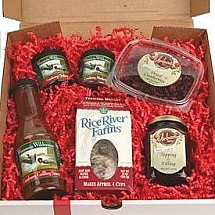 You can shop the cranberry store online for a sampling of Wisconsin … a great gift is the Grand Cranberry Box (shown), which contains cranberry rice, cranberry mustard, chutney, grilling sauce, and more! 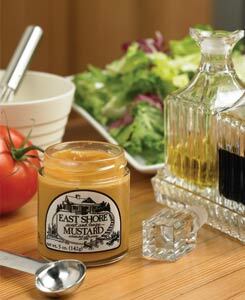 The museum outlines the history of this popular condiment, and offers a mustard tasting and shopping experience. 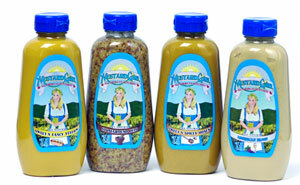 Their online mustard store is the perfect place to buy some of Wisconsin’s finest mustard, either in single packages of gift packs. Look for one of our favorites, Mustard Girl mustard, made just outside of Madison … it’s a slightly sweet and mildly spicy mustard that adds a new taste dimension to lunch time deli sandwiches. 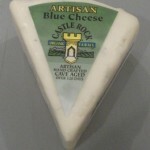 In Monroe, WI in the southwest part of the state, you’ll find numerous cheese making facilities. One of our favorite stops is the Wisconsin Cheese Shop. Whether you visit online or in person, you’ll be amazed at the variety of cheese available … if there’s a variety you like, chances are they have it! Cherries are used to create all kinds of edible treats here, whether it’s a traditional cherry pie, cherry ice cream, preserves, or sauces and condiments. Anyone with an affinity for Wisconsin will know about Door County cherry products … they make an excellent and relatively inexpensive gift. 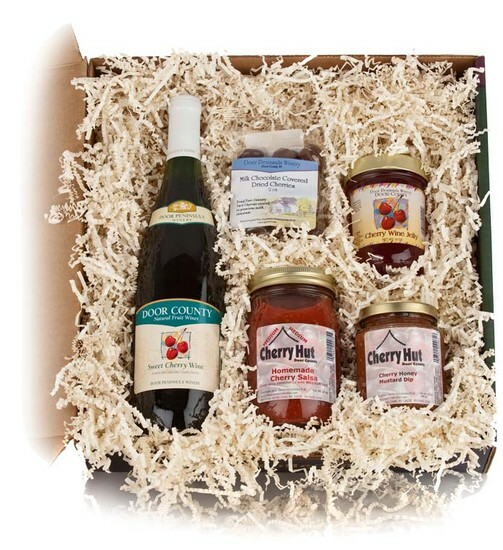 You can find a diverse selection of Door County cherry products at the Door County Cherry Hut online store, whose facility is in the heart of Door County in Fish Creek. 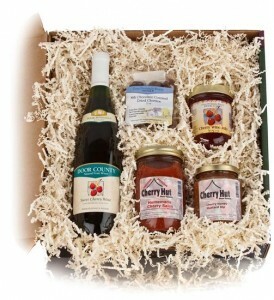 They offer gift boxes like the one shown, or individual products like cherry jam, syrup, pie filling, salsa, and a lot more. Have a sample of Door County shipped right to your door! 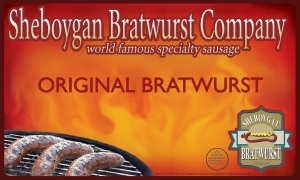 Sheboygan Bratwurst: You’ll find a lot of sausage makers in Wisconsin, but none better for bratwurst than the famous Sheboygan Bratwurst Company. These are the brats you’re probably enjoying at restaurants … the company has wholesale accounts across the country. The brats are lean, slightly spicy but not too spicy, and wow are they good on the grill! You can find them in some stores, but your best bet is to order a few pounds online for your next get together. They also sell the hard to find Sheboygan Hard Rolls, a unique round roll baked fresh daily which are perfect with sliced bratwurst and Wisconsin made mustard in between! In Door County, Charlie’s Smoke House is one of The Badger State’s most respected names in smoked fish. They’ve been at the northern tip of Door County for over 80 years, with easy access to the Great Lakes waterways. 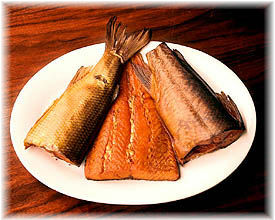 They sell four types of smoked fish … two types of salmon, trout, and whitefish. One of their most popular gift items is a three pound box containing salmon, whitefish, and trout. Order some for yourself or bring to any gathering and be the most popular guest at the party! Milwaukee based Bittercube creates a line of artisan bitters, which are used to enhance the flavor of cocktails or to help create a brand new taste. Check out their line of products at their website and get your cocktail on!